Block & Tackle efficiency approximation calculator - formula & step by step calculation to find the efficiency of the system of two or more pulleys with rope or cable connected between them. η = (KN - 1)/[(ks x N) x (K - 1)]. Sheave or pulley friction factor k, ideal mechanical advantage of the system N & Number of sheaves or pulleys s are the key terms of this calculation. Block & Tackle increases or amplifies the tension force, generally used to lift heavy loads by using sheaves or pulleys with rope or cable. Bloack is the set of sheaves arranged on a single axle. Tackle is the assembly of rope through the pulleys. 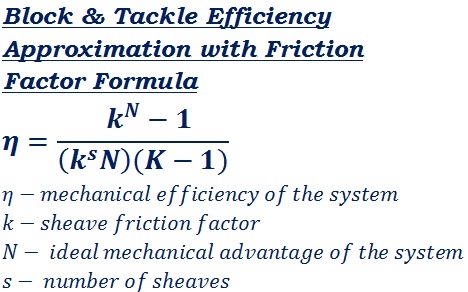 The below mathematical formula is used to calculate the Block & Tackle system efficiency in mechanical engineering. Besides, the step by step calculation for each calculation performed by using this calculator let the users to know how to perform Block & tackle system efficiency approximation with friction factor. In the field of mechanical engineering, while designing the system to lift load manually by the use of pulleys (sheaves) & ropes or cables, it's important to analyse efficiency of the system. The above formula & step by step calculation may be useful for users to understand how the values are being used in the formula to find the Block & tackle system efficiency approximation with friction factor, however, when it comes to online for quick calculations, this calculator helps the user to perform & verify such mechanical engineering calculations as quick as possible.